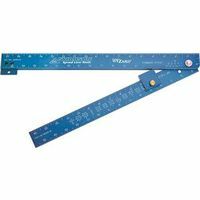 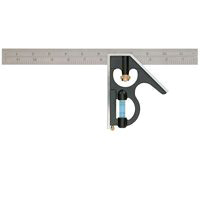 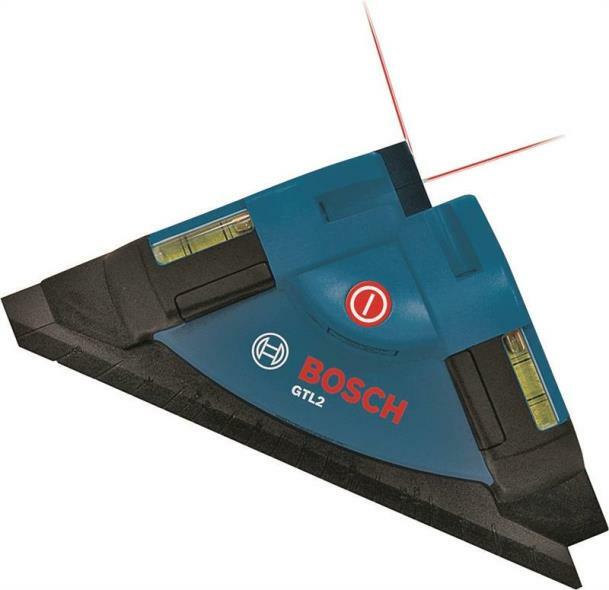 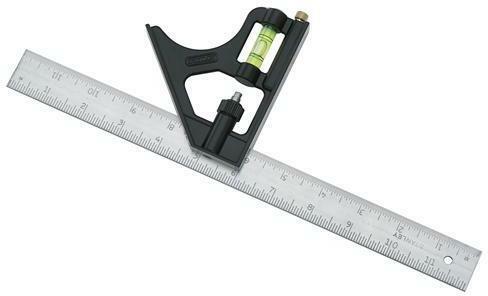 Fisher Engineer's Square: A superior quality measuring tool which includes miter square, spirit level, 45 degree angle, plumb level, height gauge, marking gauge, straight edge, steel rule, scriber, protractor set and center head. 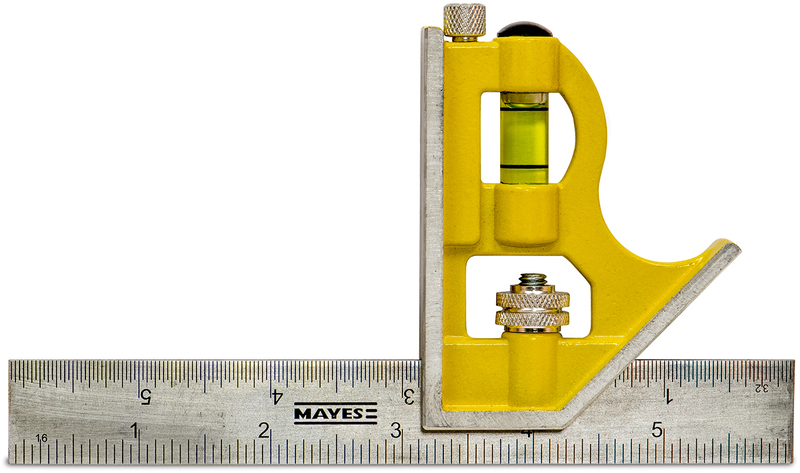 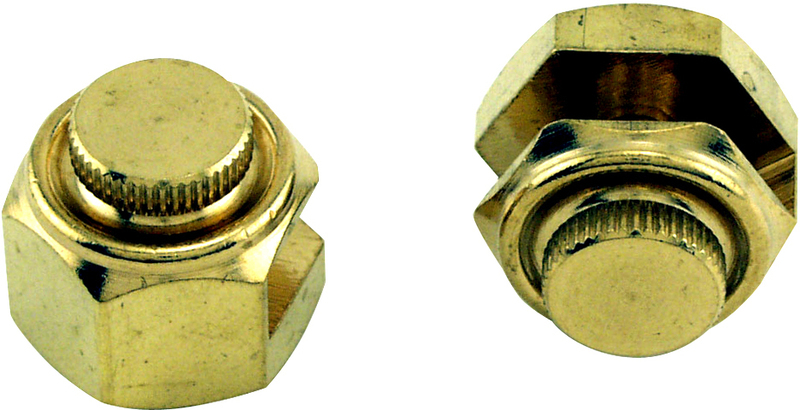 Graduated in millimeters, 16ths and 32nds. 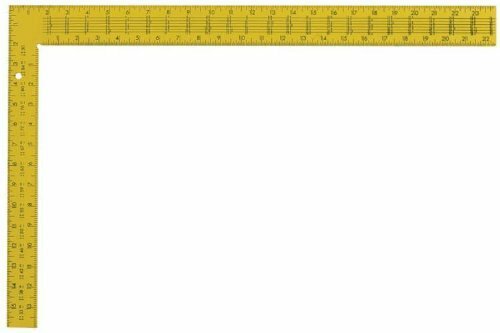 Made in U.K. 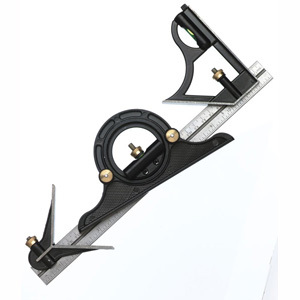 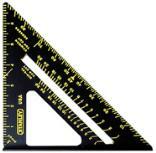 PREMIUM ALUMINUM RAFTER SQUARE Extra thick aircraft grade aluminum Individually inspected for accuracy Deep graduations are filled with yellow paint Black surface protected to resist corrosion Brace measures octagon scale Board measures 2-way read sleeve 45-011 ALUM RAFTER SQUARE SIZE:24 x 16"
QUICK SQUARE LAYOUT TOOL Rafter layout square with adjustable arm For making repetitive cuts accurately Black body with yellow graduations Heavy duty aluminum construction Common/Jack and Hip/Valley scales Can be used as saw guide, bevel or protractor Base length 10-1/4" 46-071 6-3/4 IN. 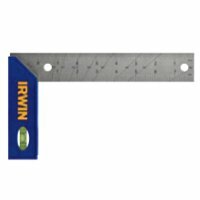 QUICK SQUARE SIZE:6-3/4"
IRWIN TRI SQUARE Rust-proof stainless steel blade square Has black precision etched scales High impact ABS handle 1794473 TRI & MITRE SQUARE SIZE:8"
COMBINATION SQUARE 6" pocket combination square Stainless steel blade with die cast body Comes with scriber and level mounted in body Carded 10227 6 IN. 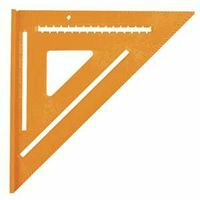 COMBINATION SQUARE SIZE:6"
COMBINATION SQUARE Durable etched, hard chrome plated blades Rust-resistant for blade longevity Precision machined working surfaces Scriber for easily marking surfaces Easy read vial, brass hardware High visibility yellow, die cast handle 46-123 12 IN. 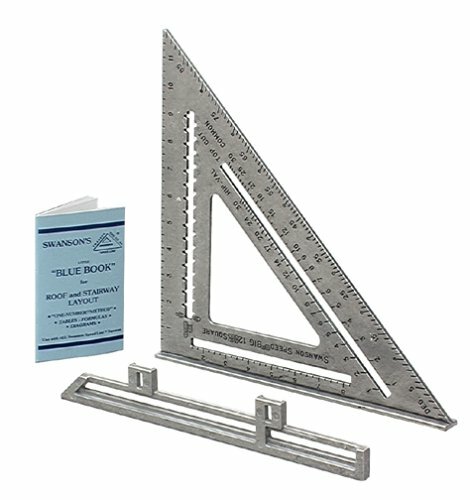 COMBINATION SQUARE SIZE:12"
RAFTER SQUARE Permanently impressed graduations Made of high grade aluminum alloy Rafter, brace & essex tables Octagon scale Thermal powder coating TS154 24 IN. 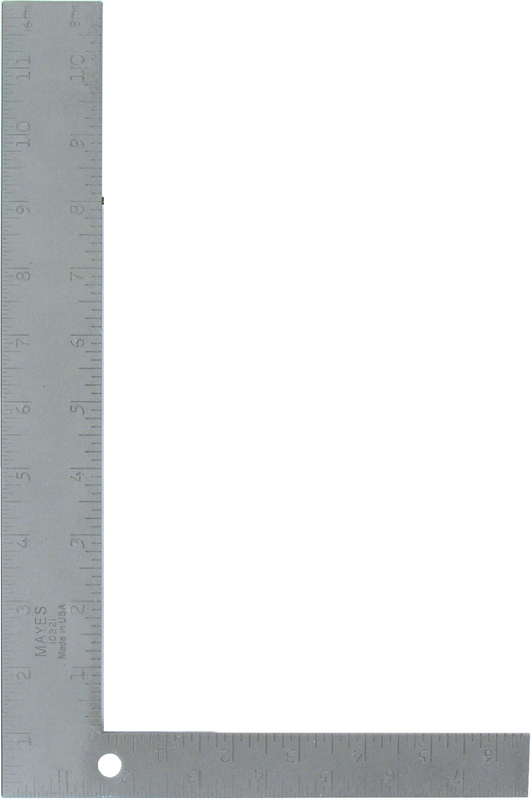 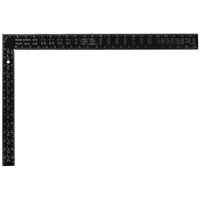 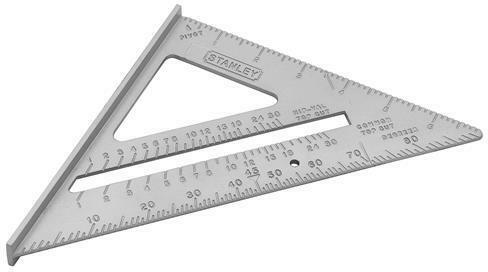 RAFTER SQUARE SIZE:24"
COMBO SQUARE Pro precision stainless steel ruler Engraved English markings Die cast body w/ brass adjustment nut Comes with scriber and level in body 10225 12 IN. 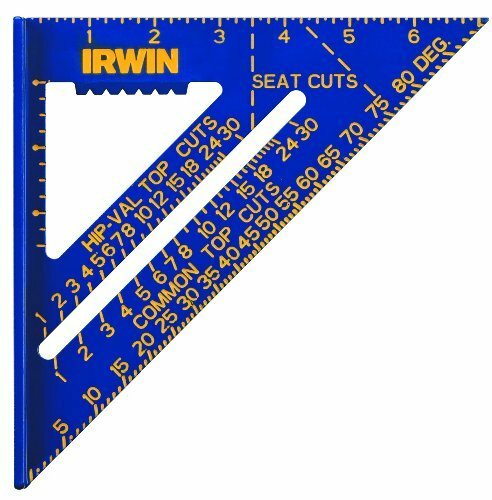 COMBINATION SQUARE SIZE:12"
HOMEOWNER'S SQUARE Buffed aluminum finish Tables of information imprinted on both sides Deep long wearing graduations Protective lacquered coating 45-300 STAN HOMEOWNERS SQUARE SIZE:24 x 16"
STEEL SQUARE 8" x 12" engraved markings 10221 12 IN. 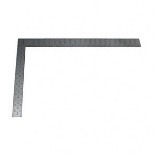 STEEL SQUARE SIZE:12"
STEEL RAFTER/ROOFING SQUARE Work hardened steel for durability & long life Buffed finish with clear lacquer resists rust Embossed graduations and figures Manufactured with English measurements Has Essex board measure, octagon scale Brace scale and rafter table 45-910 16X24 STL RAFTER SQUARE SIZE:24 x 16"
POLY COMBO SQUARE High impact plastic holder Embossed English markings Includes scriber and angle vial 11325 12 IN. 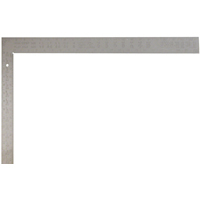 POLY COMBO SQUARE SIZE:12"
ALUMINUM RAFTER SQUARE Tables are imprinted with white or black Easy board measure and reverse reading rule SLA100R ALUM PRO RAFTER SQUARE SIZE:16x24"
COMBINATION SQUARE Die cast metal handle 12" coated blade resists rust Includes scriber stored in handle Level vial increases versatility 46-222 COMBINATION SQUARE SIZE:12"
HI-CONTRAST ALUMINUM RAFTER SQUARE Durable rust-proof aluminum body square Has permanent deep markings Can be used as protractor, saw guide and - as a tri & mitre square Blue with yellow markings 1794463 7 IN. ALUM RAFTER SQUARE SIZE:7"
QUICK SQUARE LAYOUT TOOL Lightweight aluminum, yet durable construction Detailed instruction booklet included Great for special angle measurements Can double as a saw guide Work site protractor 46-067 STANLEY QUICK SQUARE SIZE:6-3/4"